Soon the mother comes across the river and the young male retreats up the bank with its salmon. This is definitely a good move for our viewing as the bear in now about seven meters (yards) from our camera lens on the viewing platform. Moral of the story: “never mess with a mother grizzly with cubs” or “good photos are more often a result of luck than skill”. This is the look of a determined grizzly bear. The photo taken from Grizzly Bear Lodge’s viewing stand in one of British Columbia’s best grizzly viewing areas. This river on Knight Inlet has a man made spawning channel, which attracts bears from a large area. 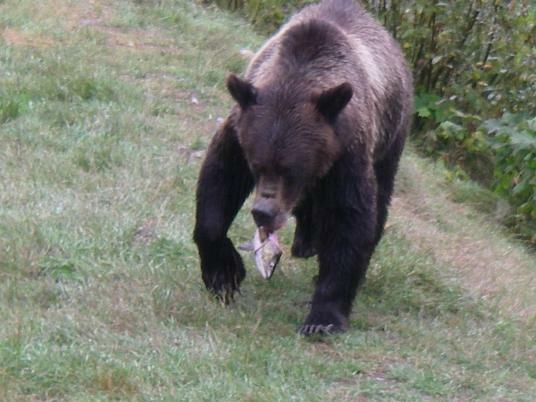 The grizzly population will increase from a dozen bears in the spring to more than forty grizzly bears once the salmon have entered the river. 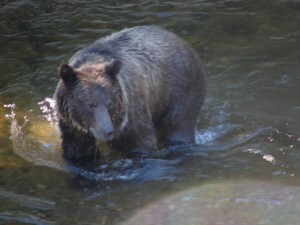 This look is directed at another bear in the river, which is coming to close to a fishing spot. Fights that cause serious harm are rare as there is an abundance of salmon and the main goal is to fatten for the winter. Mating season is long gone so that tension is not present.